UGASports.com reports that Mark Fox has landed his first commitment (premium content). Homestead (Fla.) South Dade point guard Vincent Williams will play basketball for the Bulldogs next year. Williams averaged 26 points and 5 assists per game last year. As we profiled a few weeks ago, he fell through the recruiting process due to qualifying extremely late. He had offers from UAB and several other mid-majors, and he was drawing significant interest from NC State and a few high majors. No proven scholarship shooting guards -- Demario Mayfield is coming in as a Felton recruit and Ebuka Anyaorah (redshirt last season due to injury) may help there, but we needed more potential answers. Williams is slight of build, but he gives us more offensive options here. No back-up point guard -- Assuming Dustin Ware cuts down his turnovers, he should experience a great deal of improvement next year. However, there was no point guard on the roster to push him to improve. Heaven forbid Ware get hurt, there was nobody to run the team. Williams addresses a major gap here. Major questions at small forward -- With Travis Leslie's documented academic issues and Drazen's questionable upside, we have issues here. Signing Williams gives us the flexibility to potentially play/test Anyaorah and/or Mayfield on the wing in a three guard offense. Both are listed at 6'3"-6'4". Signing Williams is not a cure all. The roster still has deep fundamental flaws for 2009-2010, but the risk of posting another momentum-less 20 or so loss season has been dramatically reduced with this signing. I think a 9-4 non-conference and 6-10 SEC record is very manageable, and that would put the team on the cusp for a Tier 3 post-season tourney like the CBI. Given where the team was last year, that would be solid Year 1 improvement. It would buy Fox more time to recruit players for 2010 and 2011. Separately...another target on the radar for next year was Derrio Green, a JUCO soph point guard. Green announced today that he's signing with UNC-Charlotte. They had been recruiting him longer, and we got in very late on him due to the coaching transition. Green's strength was three point shooting. It wouldn't shock me to see UGA hold its remaining scholarships for next season. There just isn't much left that's unsigned. We will have at least four scholarships to give in 2010 plus natural attrition. Price and Barnes inside (both seniors). Thompkins, Zlovaric, Leslie at forward (all juniors). And Ware (jr) Anyaorah, Mayfield, Williams (all soph) on the outside. So with 4 spots, you'd go front line (C/PF/SF) and probably a SG/SF like Westlake's Jelan Kendrick, especially if 2 of Anyaorah, Mayfield and Williams prove to be quality parts of the rotation on the perimeter. I still think you add one more this spring if possible. Good summary though Paul. And this is a good feeling after Mitchell (WVa), Sanford (Gtown), Vilarino (Zaga), Pickett (Manhattan), and Green (Charlotte as you mention, they no longer use the UNC part though Paul. I'm pretty sure they've dropped that same as I think UTC dropeed their UT and are just Chatanooga). If HT3 gets in shape, he can help the problem at the small forward position. I believe that is his natural position, and, if he is in shape, should be very successful there. Way to go Coach Fox! This means that the careers of Miller & Williams will be linked for at least the next 4 years. Wonder if Green's decision was in part a reaction to William's decision. At one point Charlotte seemed to be the leader for Williams. @Ubiquitous GA Alum - completely agree. And at this point, I'm w/ Fox on these two players (Williams vs. Miller). I know it is too early to tell and there is too little info on either player, BUT... it sure seems like we got the better basketball player of the 2. Obviously, they play different positions so it will never be a cut and dry comparison; however, Williams seems much more talented at this point. That's not to say Miller won't develop into a good player, but I just don't see that happening - purely based on his production vs. his level of competition thus far. Who has said Fox wouldn't have wanted both Williams AND Miller? Something tells me CMF will see MFers like this come into his program more and more in the future--like almost every other team in the SEC MFing has over the past few years. I'm guessing Green's decision to come here did impact Williams'. Charlotte is still in the running for 2 other targets, Gokhan Sirin (6'9 Turkish PF, probably our top target right now) and PG Akeem Richmond (Sanford, NC). It's no secret that our coaching staff's TOP target was Green. We were after Williams too, but we were hitting up about 3-4 Point or Combo guards to fill a void. We were more than happy to hear about Green commitment. There really wasn't a whole lot of room for a PG who wanted immediate playing time after Green committed, but we did need a guy to back up our Senior PG Dijuan Harris (who was top 5 in assists in the nation this year). 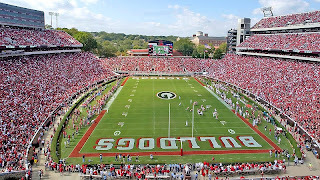 It will be Green's team to run after Harris graduates, and I'm sure the situation at Georgia is similar. Williams looks like a good prospect, one that Fox & Co. can develop and I wish him & GA the best.